BookSurge, No. Charleston, S.C., 2007. Robert Esnault-Pelterie, 1881–1957, one of the four great space pioneers, introduced the word astronautics. The Frenchman Esnault-Pelterie, also known by his initials as REP, graduated in engineering at the Sorbonne University. The fourth man in France to obtain the pilot's license, he made remarkable contributions to development of airplanes. He became an accomplished inventor and engineer and a sculptor. The French Academy of Sciences (Académie des Sciences) elected him a member in the Division of Applications of Science in Industry (Division des application de la science à l'industrie) on 22 June 1936. In the public mind in the beginning of the 20th century, rocketry and space exploration belonged more to the realm of science fiction than to the field of “serious” research pursuit. Artillery had decisively won the competition against military rockets by that time (Gruntman 2004). The men of plume replaced the men of swords as the keepers of the public interest in rocketry and spaceflight. Fiction writers occasionally sent their characters on journeys through space. Nobody captured the imagination of the public more than the French writer Jules Verne. It was at this time that isolated visionaries and thinkers, including amateurs, sketched the sinews of the spaceflight concept. Technical details of rocketry and space travel had precarious credibility. Consequently, usual all-knowing intellectuals of the day dismissed them as ridiculous. 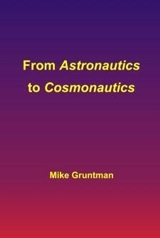 The word astronautics did not exist yet. Actually, science fiction literature had used the word astronaut by that time (see text box), but astronautics was unknown as a term of science and engineering. Esnault-Pelterie's credibility of an accomplished engineer and fame of an aviation pioneer helped him to gain acceptance by mainstream scientific audiences. On 15 November 1912, he delivered a lecture "Considérations sur les résultats d'un allégement indéfini des moteurs" ("Consideration of the Results of the Unlimited Lightening of Motors") at the meeting of the French Physical Society (Societé française de Physique). ... a vehicle built in such a way that one half of its surface would be of polished metal ... . The other half of the surface ... would be ... a black surface. If the polished surface turns to the sun, the temperature would decrease. In the opposite position, the temperature would increase. (Esnault-Pelterie 1913). Public policy. Copyright © 2004–2016. All rights reserved.